Is your home or business in Carver starting to look a little grimy? Are you concerned about the stains on your roof or how dirty the sidewalks are starting to look? Are your fences algae stained or dull looking? Fences tend to get darker and duller as the years pass. This is a natural process that wood goes through as it ages. What most people don't know is that in most cases, the wood fence doesn't have to be re-sanded and stained. Just a simple pressure washing can bring back the natural beauty of the wood. Roof stains from algae, mold, or mildew can make your property look run down, even if your roof is just a few years old. Exterior cleaning can effectively remove years worth of grime on fences, decks, roofs, sidewalks, and more. 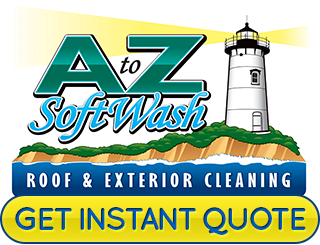 Whether we are tackling your roof cleaning, house washing, window washing, fence cleaning, or other pressure washing service, our professional Cape Cod Roof Cleaning team at A to Z Softwash has you covered. Let us spruce up the exterior of your home or commercial business! You'll be astounded at the difference our services will make! When it comes to roof surfaces, the stains are often from algae, mold, or mildew. They use the roofing materials for food, which degrades the materials over time. This problem can cause the shingles to deteriorate much quicker than they would otherwise. Getting the algae removed is important. Whether you have asphalt shingles, cedar shingles, metal roofing, or composite roof materials, our professionals know exactly how to clean them effectively. Our Carver roof cleaning techniques are safe for your home or commercial building. We use softwashing techniques so the shingles or rooftop stays completely in tact. 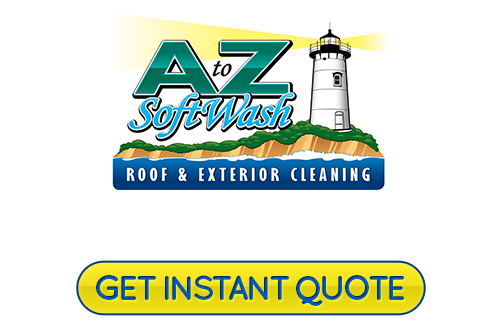 This low pressure roof cleaning process works wonders to restore the beauty of your shingles. Let our roof cleaning professionals take care of your roof so it lasts as long as it should. We can clean your roof no matter what time of year it is. The glass of your windows can get etched on the exterior if they aren't cleaned. Most people tend to neglect cleaning the windows on the exterior because they are hard to reach. Window screens can be hard to remove. But it's important to remove the grime because glass etching is permanent. Let us clean the exterior of your windows. Our professional Carver window cleaning service makes it easy for you to keep up with them. 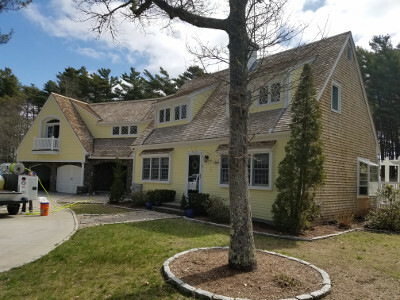 If you are looking for a Carver, MA roof cleaning and exterior pressure washing service, please call 508-209-7795 or complete our online request form.